Mon, Oct 22, 2018, 07:56 pm SL Time, ColomboPage News Desk, Sri Lanka. 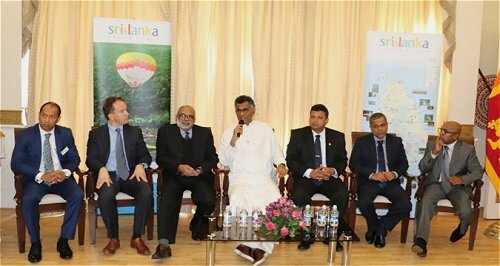 Oct 22, Colombo: The High Commission of Sri Lanka in the United Kingdom along with the British High Commission in Colombo facilitated an investment promotion event under the auspices of the Minister of Megapolis and Western Development Patali Champika Ranawaka on 18 October 2018 at the High Commission premises. The morning session was graced by Ranil Jayawardene MP, British Prime Minister Theresa May's Trade Envoy for Sri Lanka. Officials of the Ministry of Megapolis and Western Development, British High Commission in Colombo, UK Department for International Trade, CHEC Port City Colombo (Pvt) Limited, UK Export Finance and investors participated in the session. The evening session was attended by members of the Sri Lankan community living in the United Kingdom. Minister of Megapolis and Western Development Patali Champika Ranawaka informed the audience that Sri Lanka was at a crucial juncture in terms of economic transformation and briefed the audience on the investment opportunities in the country, especially the Western Province of Sri Lanka. 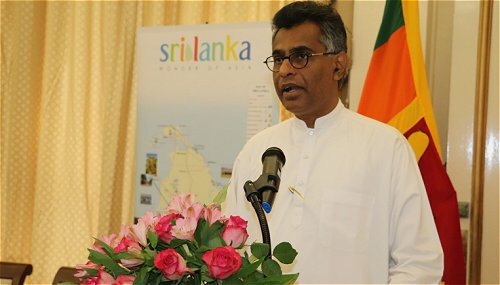 The Minister remarked that Sri Lanka was no longer capable of relying solely on the increased deployment of factors of production or productivity improvements as modes of stimulating economic growth and that Sri Lanka's future growth will be based on the transformation of its economy into a knowledge-based economy. He also remarked on the strategic importance of Sri Lanka's geographical location lying between major shipping and aviation routes, while stating that the Government of Sri Lanka will look to enhance and improve its sea and air ports. He elaborated on the Western Region Megapolis Master Plan and the National Physical Plan. MP Ranil Jayawardena stated that he has visited Sri Lanka frequently in 2018 with the intention of strengthening trade ties with the country. MP Ranil Jayawardena stated that he has visited Sri Lanka frequently in 2018 with the intention of strengthening trade ties with the country. He reiterated the support of the British Government toward Sri Lanka and stated that he would like to see deeper relations between Sri Lankan and British businesses. The MP remarked on Sri Lanka's skilled workforce and why it would be attractive for British businesses to invest in Sri Lanka, while welcoming moves by the Government of Sri Lanka to implement English Law in the Port City. The Acting High Commissioner Sugeeshwara Gunaratna in his welcome speech, stated that the Government of Sri Lanka has undertaken an expansive development program to turn the Western Province of Sri Lanka into a megapolis with among others, a dedicated tech hub, logistics hub, a port city, a financial city, multi-modal transportation linkages and smart solutions for energy and garbage disposal. He stated that the UK investors, with their long-standing history of business relations with Sri Lanka, were in an ideal position to exploit the opportunities and urged those in attendance to utilize this forum to engage with the Ministry of Megapolis and Western Development in order to create mutually beneficial linkages.